Elle magazine just advertised with a cosmetic pouch in Hong Kong as Gift with Purchase, which is available at all 7-Eleven, Circle-K outlets and news stands. You will receive an on pack cosmetic pouch by purchasing this magazine. Gift with Purchase is always a great way of thanking the costumers for the loyalty and to attract new costumers. This cosmetic pouch has a modern lady design, which will appeal to potential customers. It has an white ground with red flowers on it. It can be closed by a zipper and it does have a handle on the side, which helps to carry it around and to hang it somewhere. It is useful to store makeup tools and other cosmetic items. This cosmetic pouch is consistent with Elle Magazine’s branding of a beauty magazine. The promotional gift targets the female market segment who will be encouraged to make impulse purchases of the magazine. 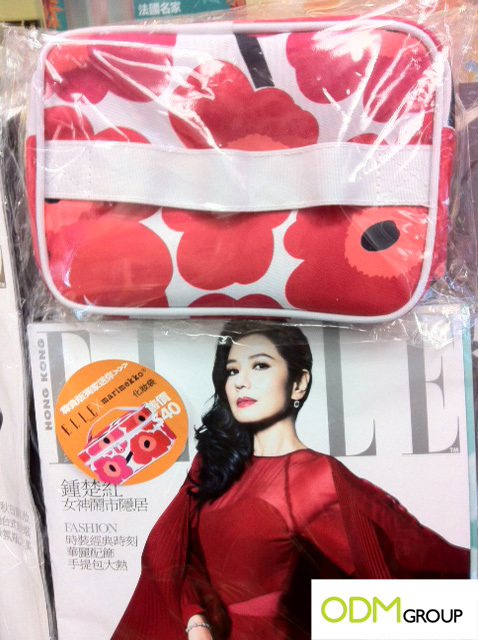 Elle may brand its logo on the cosmetic pouch to increase brand awareness and boost brand recall. Why should you think about an Gift With Purchase, like this? Brand awareness. As everybody is using a pouch nearly everyday at home or taking it out for travelling, where she is showing it to her friends, who will be curios to get one too. Incentivising Product. Onpack promos are always a great idea to increase the revenue. As you can attract costumers who would have just bought one item of them or who wouldn’t not even bought them. The sunglasses and the wallet do expand the value of the onpack and help the sales of these products.